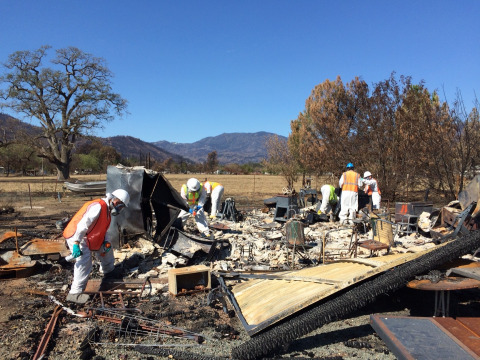 The U.S. Environmental Protection Agency (EPA) and its federal, state, and local partners continue the assessment and clean-up of household hazardous wastes in the aftermath of the Valley Fire in Lake County, CA and the Butte Fire in Calaveras County, CA. EPA mobilized to the two fire-impacted areas first to clear properties near public schools in Lake County, then more broadly in fire impacted communities under mission assignments from the Federal Emergency Management Agency (FEMA). EPA has three household hazardous waste task forces and one survey team in Lake County to assess residential properties destroyed by the fire. Each task force conducts air and radiological monitoring, and once completed, begins household hazardous waste characterization and removal. To date, 981 properties have been identified for household hazardous waste assessment and removal. This number is determined by the County as those properties where Right-of-Entry has been granted by the homeowner. In Calaveras County, EPA has three teams assessing residential properties following a similar process, and three teams from the California Department of Toxic Substances Control (DTSC) are also working in the area. The cleaned-up properties listed above are for all six teams working in Calaveras County. 678 properties have been identified to date. The Governor of California, Edmund G. Brown Jr., issued Executive Orders (B-33-15 and B-35-115) in response to the wildfire in Lake, Trinity, and Calaveras Counties to initiate clean-up of burnt debris and ash. The Department of Resources Recycling and Recovery (CalRecycle) has been assigned to manage the removal and proper disposal of the solid waste and debris left over from the fires. On September 28th, 2015, EPA On-Scene Coordinators (OSCs) from the Pacific Southwest Regional Office in San Francisco, using Comprehensive Environmental Response, Compensation, and Liability Act (CERCLA) authority, began clearing properties of household waste in a buffer zone around public schools and performing air and radiation monitoring. On October 3rd, 2015, EPA received two Mission Assignments from FEMA for debris management and to collect, stage, and dispose of household hazardous waste. For these tasks, EPA manages the categorization, removal, and appropriate disposal of household hazardous waste and orphaned containers at properties with destroyed residential structures within the Valley Fire boundary in Lake County and the Butte Fire in Calaveras County. Teams first sample the air for possible volatile or radiation contaminants, then assess the property for household hazardous waste (propane tanks, aerosol cans, pressurized cylinders such as oxygen tanks and SCUBA tanks that can pose an explosive hazard, and other containers that could have wastes that survived the fires). Items are collected and brought to the staging area, sorted, and properly disposed. Larger items such as drums and household propane tanks are also removed from the properties before CalRecycle removes the remaining debris. Properties are then sampled to ensure that contaminants have been removed and are suitable for rebuilding.